Looking forward to this timely event. It will be interesting to see how much new information turns up in the eternity between no and January. Eternity? In a time of abrupt climate change this symposium is a long way off. Thank you Kevin! Actually, I’m not sure that new information will make much difference to our discussion because it isn’t about information, but we’ll see. The panel does look fantastic! Will we have access to the recordings after they are played? Just wondering in case I wouldn’t be available for some of the dates. 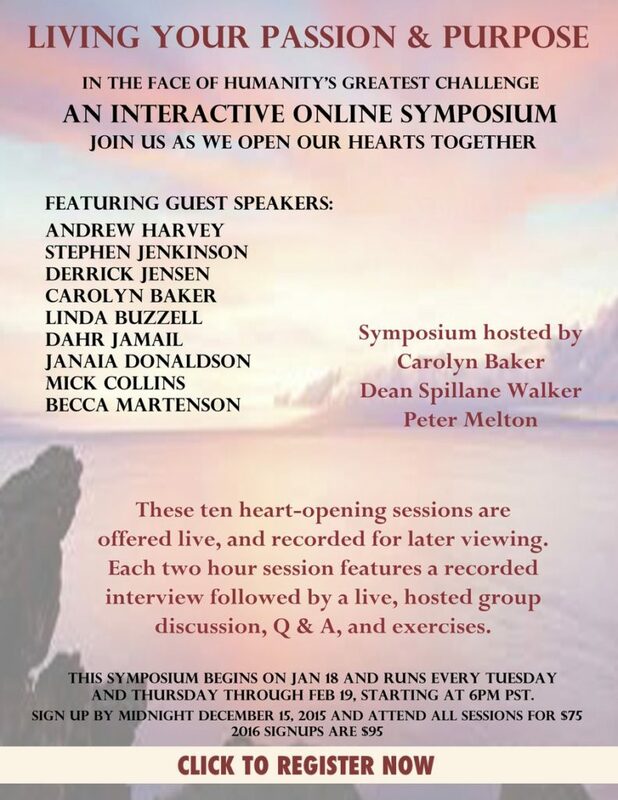 Indeed you will have access to the recordings if you register for the symposium. I just signed up. What a great way to begin 2016, a year that’s bound to be packed with surprise, joy, and grief. I am so excited and honored to be part of this program. The interviews are deep and powerful and the discussions, explorations and support we have during the webinar will be amazing. I look forward to opening our hearts together. Carolyn, your interviewee line-up looks great. Thank you so much. I’m following up on J. Colbert’s question about access to replays. How long will replays be available and accessible to paid registrants? I’ll be traveling pretty much definite w/o internet connections the first two-ish weeks. I’m guessing you’ll have access to recordings for much longer than two weeks. I will ask our team to make it at least a month if not longer. Carolyn, This so well suits this place and time that we find ourselves in! Thank you so much for offering it. If there is access to the recordings, will they include the followup discussion? Yes. With registration, you get a recording of the entire session—video presentation by presenter and group discussion live with the presenter. We are hoping that all of our presenters can join us live after their video interview, but registration gets you the recording of the entire session. Psychological Remedies for Global Warming and its Miseries offered to the Climate Change Conference and the Public. Friday Harbor WA, November 30, 2015. Backed by 50 years of field experience and a few advanced degrees in building sound organic relationships, Dr. Michael J. Cohen, Director of Project NatureConnect, insists that the 21st Global Climate Change conference in Paris this week will once again not produce a solution for this critical problem. 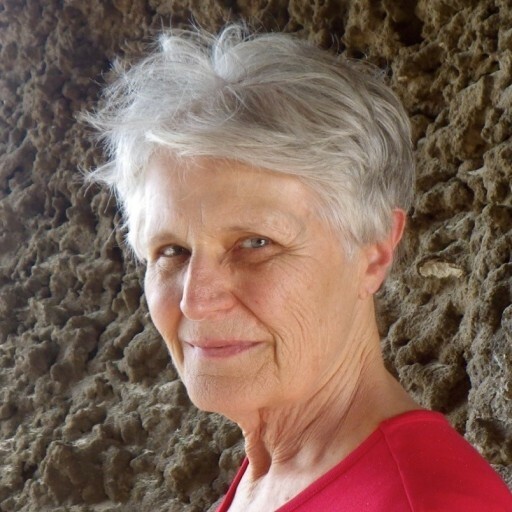 Cohen predicts “The Conference will fail because the process of Educating, Counseling and Healing With Nature (ECHN) thirty years ago provided the remedy for our predicament yet conference participants today continue to omit ECHN as well as withhold it from the public”. To correct this failing Cohen, author of ten books on the subject, has today offered free the key ECHN methods and materials necessary to deal with the Climate Change impasse as well as the miseries it produces. These remedies are located at http://www.ecopsych.com/orientfree.html. ECHN works because it validates that humanity is part of the self-correcting life and beauty of Planet Earth. By investigating the purity of self-evidence in nature, ECHN researchers have discovered that the essence of Earth’s life and its survival constantly communicates critical life-in-balance information to us through 54 natural senses that we genetically inherit. Our well-being is at risk today because our education and counseling teach us to ignore these 54 senses in support of our nature-estranged Ego and excessive profiteering. Within the freedom and unity found in natural areas, in congress our natural senses help us reasonably make contact with and sense of the whole of life. There they register how to build pure and balanced relationships with our Planet. To our loss, we excessively conquer and exploit Earth’s life and suffer our disorders because our dominant, material based “objective” processes dismiss as “subjective” the 54-sense information we receive from Earth. ECHN corrects this disastrous mistake. Its whole-life art and science enables anybody to create reasonable, authentic moments in nature, backyard or backcountry, moments that let Earth itself teach us what we need to know. ECHN comes with a unique Warranty. It states that its nature and earth-connecting activities safely empower anybody to make undeniably correct, conscious sensory connections with the non-literate, attraction and love-based core of the Unified Field, in and around them. That attraction field is the Higgs-Boson that Albert Einstein postulated in 1935, the acknowledged 2012 “God Particle” aliveness by which the unadulterated Universe continues to make its own garbage-free time and space, moment-by-moment today as it has through the eons. Cohen contends that our catastrophic personal and global issues will grow as long and the media, science and public continue to disregard ECHN. He said, “We need its restorative wisdom from the ‘now’ life of Earth’s fountainhead of authority rather than from our outdated inaccuracies.” Cohen, who believes Planet Earth should be protected as an endangered species, has established courses, degrees and training programs that help make any individual or their interests more organic. Will the webinars be just audio, or a full video recording? Want to know if I invite friends over to listen together. The recordings will be full video. Yes, invite friends to listen together. Webinar is full video. Do invite your friends! Thank you for setting this up, I look forward to sharing with like-minded people, especially now, when things are getting so intense and the times are so crazy and we need to stay centered and vulnerable-strong to help others who might not have had this opportunity we are about to share. Thank you Lena for registering. I look forward to having you with us in this incredibly important event.